The Idaho State Legislature passed three bills this year that have the potential to significantly improve the quality of education in Idaho. It’s imperative that we are all cognizant of what the legislation actually does, as opposed to what it purportedly does. The Students Come First laws raise the minimum teacher salary to $30,000 a year and also puts in place a funding mechanism to increase the minimum salary for the future. They maintain the current salary apportionment grid for teachers with longevity and added educational credits. The Pay for Performance (PFP) plan provides extra compensation for teachers who serve in hard-to-fill positions, like calculus teachers in small school districts, or leadership roles, like mentoring new teachers or developing curriculum. This comes as a bonus to those teachers on top of their pay grid compensation. The local school board determines hard-to-fill positions and the extra compensation. PFP also allows for teachers to earn bonuses beyond their base salary for meeting or exceeding student achievement goals at the state and local levels. This will provide for the entire certified staff of a school to receive bonus pay when their school is showing growth in student achievement. Local school boards set local student achievement goals for bonus participation. Teacher tenure is preserved for those who already have it. Those who don’t, including new hires, will not have continuous contracts, or the guarantee of a teaching job regardless of their performance. They will be offered one or two year contracts after a three-year probationary period. Contrary to the disinformation and misinformation being widely promulgated, collective bargaining and union representation are not eliminated. Rather, their collective bargaining is limited to matters pertaining to salary and benefits. In the past they could negotiate as part of the contract things like bell schedule, school calendar, teacher evaluations, and grading methods. This gives the local school board much more flexibility and latitude in those peripheral issues without jeopardizing salary and benefit negotiations. The new legislation retains the right of local school boards to maintain policies addressing grievance procedures for teachers, preparation time, and extra duties. This is not eliminated, as has been erroneously represented. All collective bargaining sessions must now be conducted in public. Since we as taxpayers pay their salary and benefits, it’s only logical that these sessions should be more in compliance with Idaho’s open-meeting laws. All local school boards and school districts must be totally transparent in fiscal matters, including master contracts and associated information. Further, the State Department of Education will create a web-based fiscal report card and will post financial data and statistics for every school district, public charter school, and the state. Teachers’ and principals’ evaluations will now be at least partially based on the job they are hired to do, which is to teach our children. The student achievement standards for evaluative purposes will be established by the local school district. For teachers who don’t already have a personal computer in their classroom, beginning in the fall of 2012, they will get one. They will also be trained on how to integrate computer technology into the curriculum and into the classroom to raise student achievement. Starting with the Fall semester of 2012, high school teachers will be provided mobile computing devices. High school students will be provided access to similar devices (most likely, inexpensive yet powerful devices like Apple’s iPad). Local districts will determine how best to utilize these devices on a daily basis and teachers will decide how to incorporate them into the learning process. The local boards will also decide whether to allow students to take them home or not. Starting with the graduating class of 2016, students will have some online curriculum. The State Board of Education will determine how much will be done online, but local districts will determine the curriculum. As taxpayers, we benefit by the increased transparency in the disposition of financial resources. As parents of public schools, we benefit by the increased focus on results and achievement, by rewarding schools and teachers for jobs well done. The incorporation of technology in the classroom and online curriculum helps the children learn how to use it to augment their education, while increasing efficiency from a cost standpoint. And the Students Come First legislation empowers teachers to earn more based on their performance and grants more flexibility and authority to local school boards to teach our children. Even President Obama’s Secretary of Education, Arne Duncan, has said, “Challenging the status quo will take courage. It will take commitment. And it will take collaboration,” as he has laid out similar proposals on a national level. 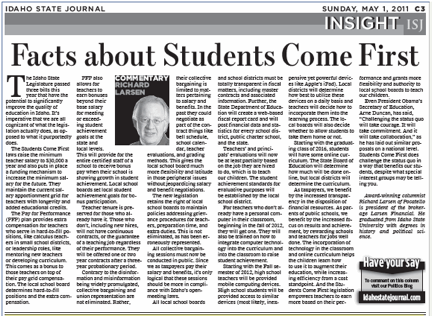 Students Come First does challenge the status quo in a way that benefits our students, despite what special interest groups may be telling you.